Be one with yourself and all things will come to you. A mobius holds deep spiritual significance. The never-ending loop demonstrates a universal oneness of infinitely intertwined forces. Lao Tzu’s engraved quote reminds you that when you remain true to yourself, a universal rhythm beats within your soul and you are part of a cosmic wholeness. The sterling silver mobius charm doesn’t just dangle from a chain. The chain repeatedly wraps around the charm to form a strong grip on the wisdom it holds. 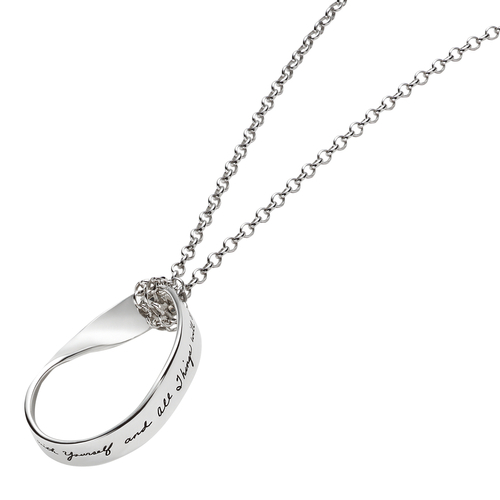 This engraved sterling silver necklace is a gift brimming with significance that will surely become a cherished keepsake.